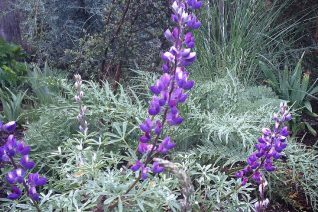 Our locally native silver leaved lupine. A wildflower that beckons gardeners with incredible metallic silver foliage and spires of blue and white flowers from late spring into summer. It has some exacting requirements. Its best to know where you find it in the wild. Steep, steep cliffs and steep open road cuts. What do they have in common? Excellent drainage and little summer water. Spreading almost shrubby evergreen plant to 2′- 3′ wide on average. The very pretty fragrant flowers rise up to about 3′. It seems to resent a lot of competition from other plants- give it room, its own space and again, perfect drainage. Highly deer resistant also not as attractive to rabbits. Oregon native plant.